Nevada's Clark County coroner's office issued a statement late Tuesday saying the death of Cirque du Soleil performer Sarah Guillot-Guyard was accidental and was related to multiple blunt force trauma. Nevada’s Clark County coroner’s office issued a statement late Tuesday saying the death of Cirque du Soleil performer Sarah Guillot-Guyard was accidental and was related to multiple blunt force trauma. The 31-year-old Guillot-Guyard died Saturday, June 29, after she fell more than 25 metres while performing in front of an audience at Las Vegas’s MGM Grand hotel. The statement issued by the coroner said the Nevada Occupational Safety and Health Administration (OSHA) is continuing its investigation into how the accident occurred, which could take up to six months to complete. The mother of two had been with the original cast of Cirque du Soleil’s Ka since 2006 and had been an acrobatic performer for more than 20 years, according to Cirque officials. Born in Paris, she is also listed as the head coach at Cirquefit, a program that offers acrobatic fitness classes for children. Cirque spokeswoman Renée-Claude Ménard said Guillot-Guyard didn't slip out of her harness, but couldn't provide additional information about what led to the deadly fall. "I am heartbroken," Cirque du Soleil founder Guy Laliberté said in a statement. "We are reminded with great humility and respect how extraordinary our artists are each and every night. Our focus now is to support each other as a family." 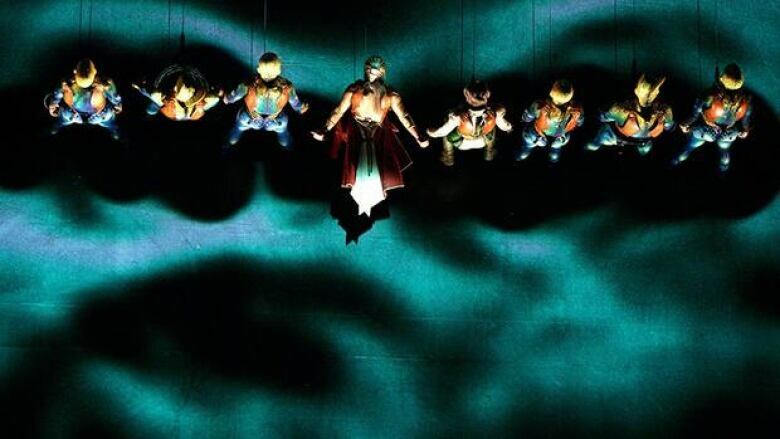 While Cirque performers defy gravity every show — soaring over audiences, scaling vertical walls and dangling aloft in aerial ballets — the incident was the first stage casualty in the company's 29-year history, according to Ménard. Witnesses told the Las Vegas Sun that the accident occurred during a fight scene near the end of the show, which combines acrobatics with martial arts and puppetry and tells the story of two imperial twins on a quest to reclaim their Far East palace from evil warriors. Visitor Dan Mosqueda of Colorado Springs, Colo., said the woman was being hoisted up the side of the stage when it appeared that she detached from her safety wire and plummeted to an open pit below the stage. "Initially, a lot of people in the audience thought it was part of the [show]," he told the Sun. "But you could hear screaming, then groaning, and we could hear a female artist crying from the stage." Montreal-based Cirque du Soleil was established in 1984 and now includes more than 1,300 artists, according to its website. Ka is one of 20 shows playing around the world this year — eight of which are based in Las Vegas.